There are many different types of string, made of different materials for different purposes. Main differencies are: material, thickness and tension, surface finishing, proportions of core and windings, production technology. Common string thickness - defined in inches: .008, .009, .010, .011, .012, .013, .014, .015. Acceptable word labelling: Light, Medium, ... (see nylon string description). There are many others hybrid sets of strings except listed thicness. Hybrid sets are usually composed of heavier bass strings and lighter treble strings. More accurate information about a string set is contained in tension description declared in kg or lbs. Common string thickness - defined in inches: .030, .040, .045, .050. Acceptable word labelling: Light, Medium, ... (see nylon string description). Round wound, half round, flat wound, rounded with special material (nylon, bronze and nickel combination, ...). Nickel-bronze or nickel-phosphor bronze - double wound. 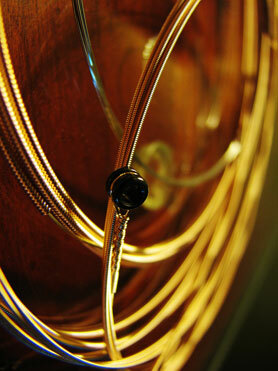 Designed for using acoustic strings with magnetic pickup. Nickel-nylon, chrome-nylon, steel-nylon - nylon wrapped regulal wound strings with a view of thickness rise without dramatic tension changes. Silk and Steel - silk core combined mostly with silver wound. Very soft and very loud strings.